Where Star Trek shines is in how Gene Roddenberry reflected humanity back through the other races: Vulcans and pure logic, the conflict driven Klingons, the military industrial complex of the Romulans, the greed of the Ferengi, the techno hive zombies that are the Borg. So many good philosophical questions are explored with each race, but I especially enjoy the Borg. Some Borg themes I see are the meaning of individuality, the good of the many vs the few, the cost of war, and the need for hope. 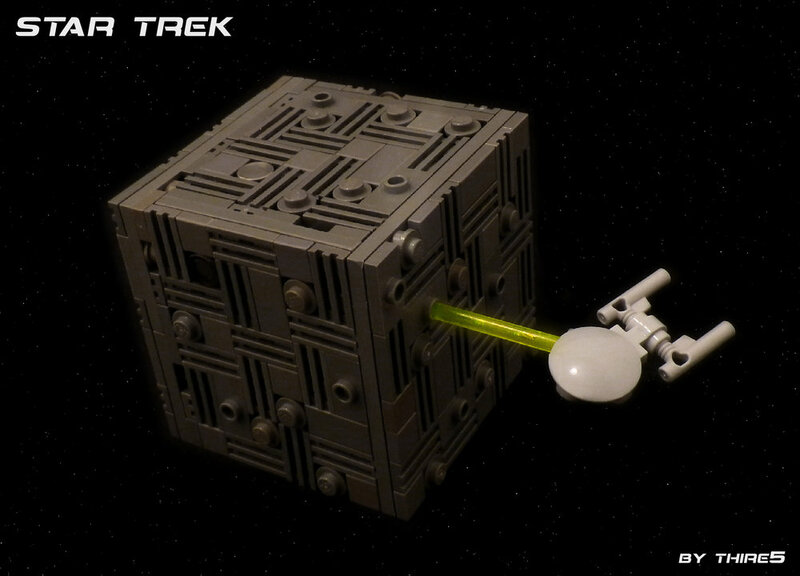 Martin Latta captures a Borg vs the Enterprise D encounter in a small vignette. The shape of Federation vessels is challenging to capture at any scale, but he nails the NCC-1701-D and the repetitive use of grille plates, jumpers, and single studs captures the super greebled Borg cube exterior without overdoing it at this scale. Well done, Mr. Latta, set course for Wolf 359 warp 9. Engage.